The Heretic, over at Heretic, Rebel, a Thing to Flout, posted a fun story about distracting Mormon missionaries. Ever since becoming a heretic myself, I have been looking forward to new opportunities to distract missionaries. So far I haven't had much success living out in the middle of nowhere. But this summer, over the July 4th holiday, I ran into a couple of Elders setting up a display in Alexandria, VA. One Elder was so distracted by me that he was watching me rather than paying attention to the fact that the folded-poster he was setting up was upside down. At which point I started to fumble for my camera. I was standing about 30 feet away when I finally took a picture but unfortunately, in the mean time, the other Elder noticed and had him correct it. 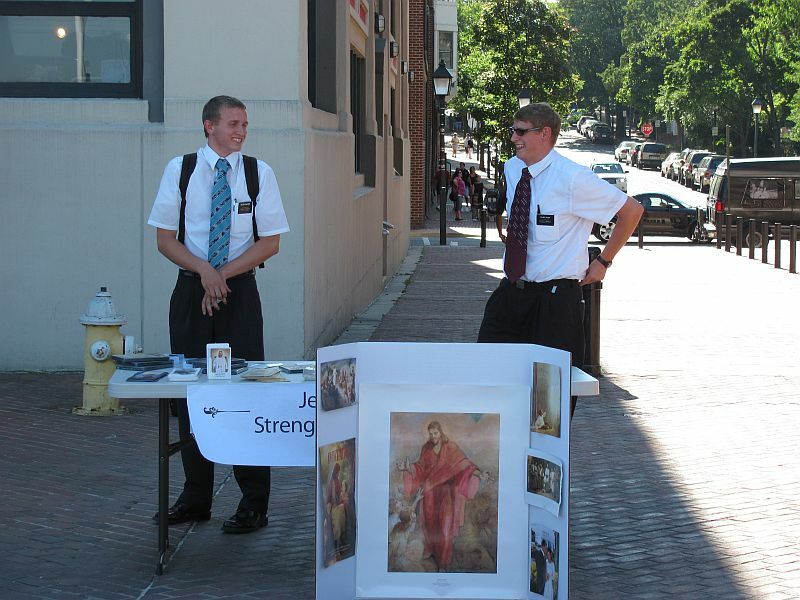 Bummer, it would have been awesome, a picture of a Mormon missionary watching me as he was setting up a poster upside down. I was tempted to walk over there and ask him to recreate the scene for me so I could take a picture. Lesson learned. Never put away camera! They were sort of giving each other "high fives" for whatever reason as they noticed me take their picture. I was with two other somewhat regular looking gay guys who both looked like tourists, but I stood out, I was wearing knee high boots. I would like to think he was enamored with my boots. Many people are. I mean I totally understand if he was as I can totally relate. When I was a missionary in New Zealand back in the early 91, I found myself distracted, ...erm VERY distracted by guys in those one piece motorcycle leathers with matching boots and helmet as they zipped down the road on their matching sport bikes. I HAD to watch them! I could not look away! Every time they went buy I twisted my body around in the car seat to continue watching! It's just one of those things. Leather clad male bodies drive me wild! My companion, however, was in his own world. Staring down the road. Lost in his own head somewhere thinking about his girlfriend at home or the fact he was leaving the mission in about a month anyway. He had no idea. So young, so earnest, so naïve. Those were the days. I'm glad they're over. Looking at the pictures of the two Elders gave me a bad flashback to when I was a missionary. It seems I spent half of my mission on the streets of Tokyo next to some sort of display, trying to get people to talk to me. Did a few street displays in Milan. Ah, those were the days. I did plenty of time in Norway with a display table on cobblestone streets. We'd no sooner get set up then the rains would shut us down. The question is, why are missionaries so damn cute? TGD, I thought of you immediately when I heard a radio commercial for a well known menswear outlet last week stating that thigh high boots were a trend this fall-and I do not think it was an attempt at humor. You were just ahead of the curve. I thought I wonder if they are playing this where The Gay Dot lives? Hey @Bear! Long time no hear from! Thanks for the complement! @Jack, I was going to mention the cute part but I took it out at early on. I don't know, I'm old enough to be these kids parents. It just didn't feel right to say it. I was lucky that we never did any street displays. It was all door to door or referrals. It's really surreal to look back on it. And lately some fellow former missionaries have been posting pictures of me as a missionary back in the day on Facebook. It's like I'm looking at a stranger in those pics. I wish I had all my pictures from my mission but I lost all of them in a rather unfortunate circumstance involving a poorly secured car door traveling down the highway at 120km/h. @Quite Song, I do have a pair of thigh high boots that I wear at renaissance festivals. But I'm curious as to what type of thigh high boots they were talking about. For men? LOL! I'm an NPR listener so I wouldn't know if it was played out here. Probably not. @Stella, You grrls had it easy in a way. You got to be creative with your clothing. Many of the Sisters in NZ actually got away with simple t-shirts. They just stuff some shoulder pads in them and they suddenly looked formal. The best we Elders could do was the tie. Boots never fail to put me in my happy place. Thanks for the shout out, TGD! Always appreciated. 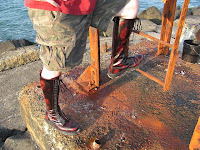 Also, awesome boots. I bought another pair of boots this week! Always exciting! @Heretic, your welcome and, thank you! Keep up the fun stories and keep buying boots. Boots are made for walkin' you know.